Uninstalling software in Windows is easy when we are talking about one program - you just find it in the list of Apps and Features and click Uninstall. But when it comes to uninstalling several programs, the process gets more complicated and time-consuming. You can’t remove Windows programs in bulk, so you’ve got to uninstall each program one by one. Windows doesn’t allow to uninstall multiple programs simultaneously to avoid conflicts between each program’s uninstallation settings and files. 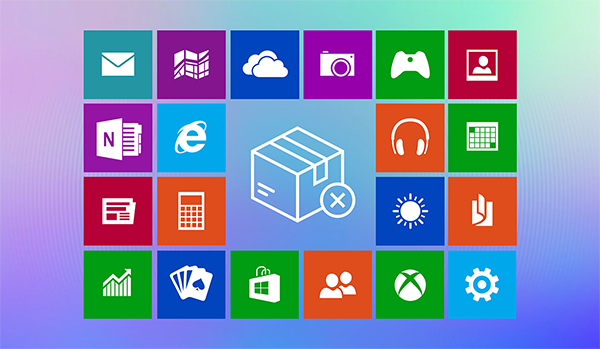 Windows default installer system was created to be unified for all applications, and it prefers accuracy over speed. If uninstallers could be launched together with no additional monitoring they could cause serious system crashes. That’s why you can manually launch uninstallation for one program at a time. To make the process faster and more effective, you need a special tool to uninstall programs. CleanMyPC Multi Uninstaller keeps program uninstallers under control so you can remove several programs at once with no risk of errors. Batch removal of programs takes several steps. 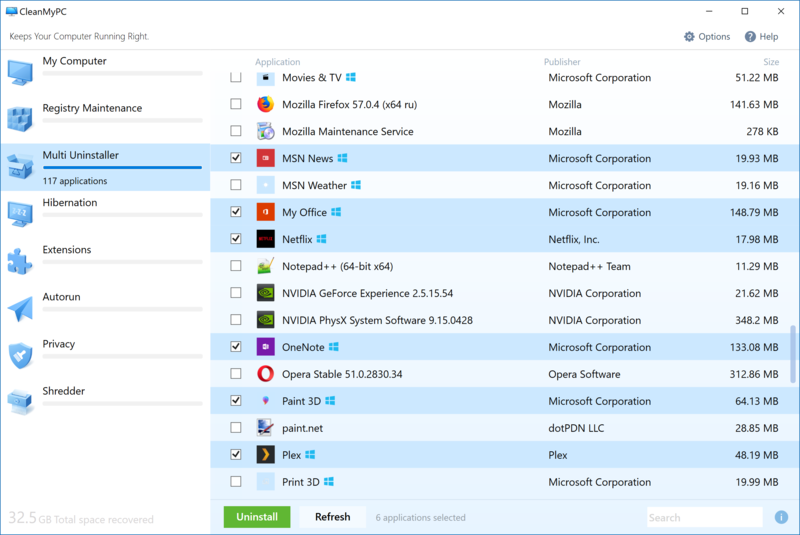 Before you launch the uninstallation you can go through the list of applications you have on your PC and find those you want to get rid of. As soon as you confirm your choice CleanMyPC starts uninstallation of each program on your list. It shows the status of the program uninstallation. As soon as every application on the list is deleted, CleanMyPC Multi Uninstaller proceeds to the next step, which is leftovers cleanup. First of all, you uninstall programs completely only when you delete all the files and folders related to them. Otherwise, they will be clutter on your PC without you even knowing it. Second, uninstalling programs should get you more space, but if any junk is left behind, you won’t get extra space on your PC. Such program removal is useless. CleanMyPC Multi Uninstaller takes care of your PC space and speed, so it cleans programs leftovers automatically after each uninstallation. You are in control of the uninstallation process, so if you don’t want to remove program remnants you may cancel the leftover cleanup, or uncheck some items that you want to keep. However, it is highly recommended to complete this step to perform a clean uninstall. Sometimes when you download new software or want to install new updates you get the low disc space warning. that’s when you want to quickly free up space on your PC but you don’t know which program can be removed safely. With Multi Uninstaller you can solve this problem quickly. It is a safe uninstaller that will help you to get extra space with no risk for the system. A new PC doesn’t mean a clean PC. You often get a computer with a pre-installed pack of programs you are not likely to use. To get rid of those, you just have to run program uninstallation. It is okay to install and test several programs with the same functionality before you choose the one that suits you. however it is not necessary to keep them all, otherwise, they may cause software conflicts. after you try out the programs and choose the one you like, you should uninstall other apps completely. Broken programs are those that were partially uninstalled but remain on your PC. For some reason, you are not able to launch uninstallers for these applications, so they can’t be removed properly. CleanMyPC Multi Uninstaller detects broken programs and show them in the list of programs you can delete. After you start uninstallation of broken programs CleanMyPC will search for all related items to remove programs completely from your PC. If you happened to install the programs that contain adware or may have any security issues, you should remove them from your computer. Old programs that are not updated may cause security issues as well, so it is better to uninstall old software and replace it with new once in a while. If you used your PC for work and now want to make it a home computer, you’d probably need to reorganize it and get rid of the programs you will no longer use. Uninstalling unused programs will help you make your PC faster and more efficient for home usage.